The average modern American supermarket offers around 47,000 products and the default thinking of marketers around choice is; the more choice the better. This idea is about how fewer choices can sometimes actually give more sales and explores how to think about applying this to your business for higher sales and increased customer satisfaction. In research it is found that a great array of choices can at first look very appealing to consumers but can actually reduce their motivation in buying the product. Independent field tests with jam and chocolate found that choosing from only 6 choices gives a higher likelihood of actually purchasing any of the products when compared to a more extensive selection of between 24-30 choices of product where purchase behavior went down dramatically. Take note that the same studies found that the extensive selection could get more consumers to stop and look at the offerings but with lower purchasing behavior in the end, as described above. This is a new field of studies and more studies are needed to gain a deeper insight into why exactly that is. The theory could be tested in different (otherwise comparable) regions (sales channels). This can be done by offering a smaller product offering in comparable regions and comparing sales and profit numbers to benchmark outcome. Another possible condition would be to compare smaller niche shops for your products, where choice sets naturally are smaller, compared to outlets and stores with bigger and more exhaustive alternatives to choose from. Potentially there is a silver lining to focusing your distribution efforts on smaller niche sales outlets or even to have contracts specifying the amount of allowed competing choices in your product category. You could also experiment with creating a new category for your product (either by adding a feature or framing an existing feature differently) similar to what the “Vitamin Water” category did when they set themselves apart from regular soda industry successfully, through creating a new category of drinks which consumers have a different mental account for. If you are successful in positioning your product in a different category (choice set) your product is likely to be among a far more limited choice set, which creates an illusion of reduced choice and possibly increased sales. This idea adds the most value if applied early on to distribution and sales within a company. We would also encourage bringing this idea into product development; concentrating efforts on fewer products in terms of your business offering (think Apple product strategy). Specifically we think it could be of great value to experiment with when expanding to new sales regions as described above. 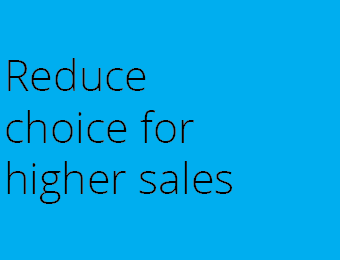 The idea of fewer choices to generate more sales has the potential to prove that less can generate more in sales.